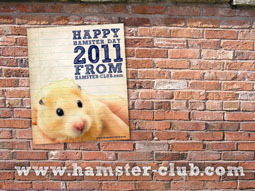 Hamster Club :: The Hamster Day! Celebrate The Hamster Day on 12th April to commemorate the first Syrian Hamsters that were found and bred which then led to the domestication of our pet hamsters! For this event, Hamster Club created two beautiful hamster wallpapers which may be viewed or downloaded here.